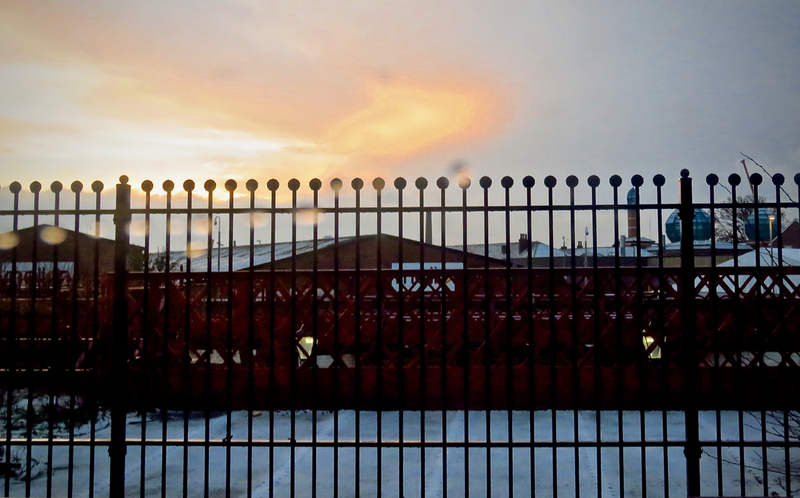 Taken through the train window this morning, and more of an abstract than anything else: the rain (or rather sleet) drops on the window in the upper left quadrant are all too apparent. But it does at least illustrate that we had our first real snow of the winter today. Pretty feeble stuff, admittedly: but it was there. 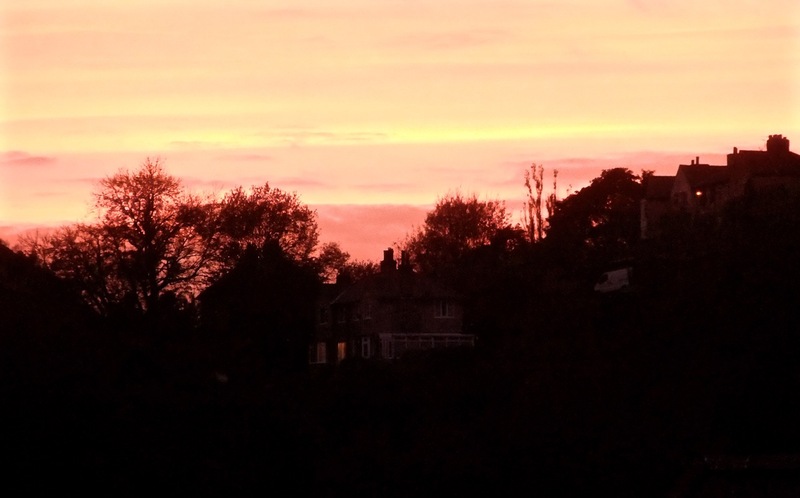 For about fifteen minutes this evening the sunset turned the sky into a blazing inferno. It came and went away again very quickly and several people I spoke to later, who had been inside at the time, had no idea what they had missed. They can be excused — but not the people on the train, who seemed far more interested in their screens than the real-life show outside. 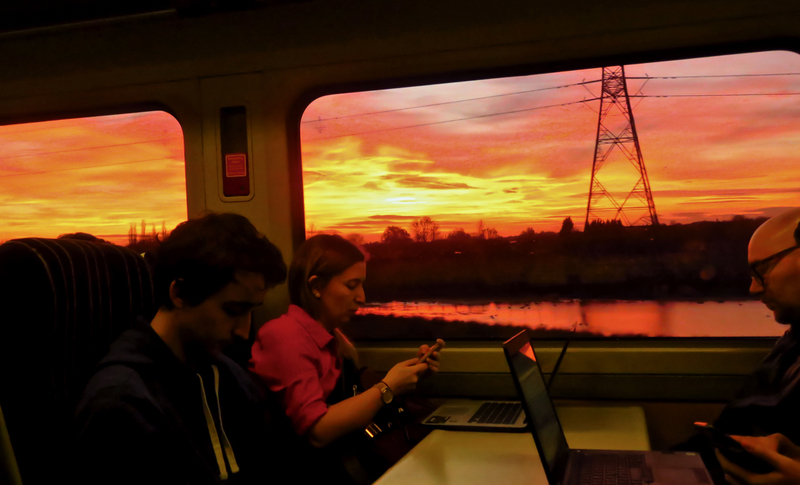 I wanted to be sat on their side of the train for the best show. But I guess this shot illustrates it well enough. 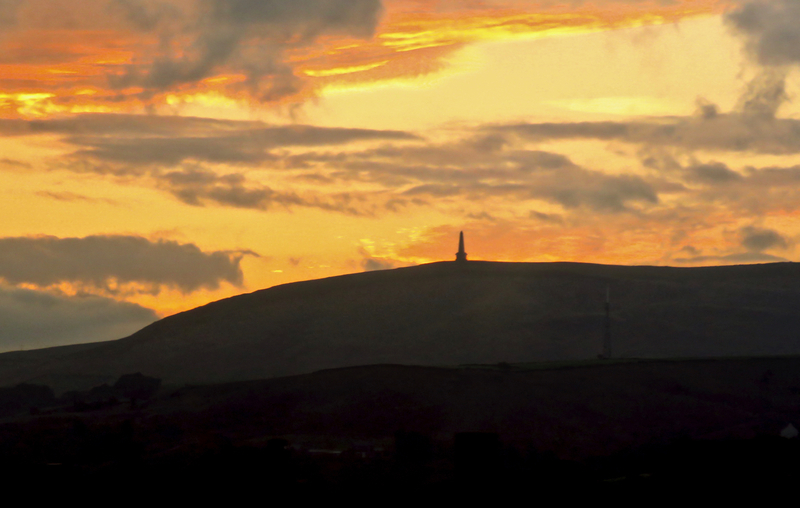 The monument atop Stoodley Pike is visible for much of the train journey from Hebden Bridge to Todmorden, but the best view of it comes at the end, as one crosses the viaduct just prior to Todmorden station. You get about five seconds to see it properly before trees, then the station buildings, obscure the view. Seeing as I experience this view every time I get a train to Manchester (as long as I’m sat on the left), in a sense I have been waiting over seven years to offer up a version of this picture on the blog: so if I remain committed to never repeating myself, let’s only show it when it seems particularly worth it. Did it make the 5:35am alarm call (and 7:45am arrival in the office) worthwhile? Er…. mildly, I guess. Today was proving a very mundane day photographically and I was struggling to find a representative picture – until the natural environment obliged with the last light of the day. Tomorrow is the 50th day of this blog, by the way. So look out for the page of ‘outtakes’ (or ‘best of the rest’) which I’m going to stick up tomorrow alongside the daily picture.